Remodeling the bathroom? Start with the floor. 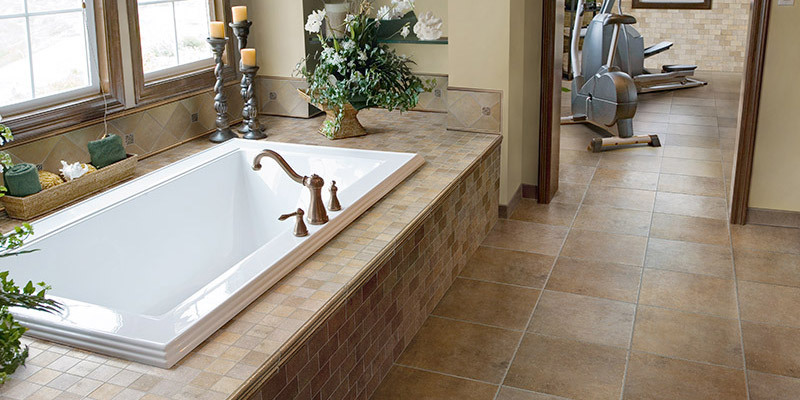 Available in many styles, colors and textures, tile is the most popular option when it comes to bathroom flooring. From affordable, basic ceramic tiles to more adventurous metal or glass - the options are practically endless. Indianapolis tile store, Kermans, has some great recommendations to get your bathroom remodeling project started. What tile floor is best for your bathroom? Ceramic tile is a classic choice for a bathroom floor - and an inexpensive one too! Ceramic tile gives you a long-lasting, easy-to-clean floor and you can have it textured to help prevent slipping. Vinyl has always been durable and low maintenance, but it hasn't always looked this nice. Luxury vinyl tiles can mimic the look of stone or wood for a fraction of the cost. Luxury vinyl is becoming one of our most popular floor choices. If you want to add visual interest to a tile floor without breaking the budget, talk to our designers about creating a "rug" of tile in front of the vanity or the space where you step out of the shower. Another idea? Add glass tiles throughout a ceramic floor for creative accent points. Looking for cost-effective flooring? Choose tile! Glass tiles can be used to create a completely one-of-a-kind pattern for your floor. A mosaic glass floor adds an elegant, upscale touch to a bathroom. And if you're bathroom is on the small side, it can be a fun way to add lots of design at a fairly affordable price. Tile isn't just used on the floors. Bathrooms are the perfect space to add tile as a backsplash or accent wall that really grabs your attention when you walk in the room. A focal wall made from glass, stone, metal or ceramic tile is a great way to add big design without spending a lot of money. Ready to get started on your bathroom remodeling project? Our free design staff is ready to help! You can schedule an appointment in advance and let us know some of the details of your project. One of our experienced designers will have samples and ideas ready and waiting when you arrive at our Indianapolis flooring store.